We have had a big increase in visitors to our website since the British Orchid Show and so if you are a new visitor it may be useful to explain 365 days of orchids. 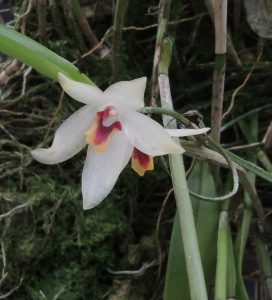 On January 1st 2017 we set ourselves the challenge of posting a different orchid species that was flowering in the greenhouses on each of the 365 days of the year. Well we succeeded and in the process produced a detailed record of 365 of the species we grow. In 2018 we decided to continue allowing us to add more species as they flower and add additional information for any species covered in 2017. 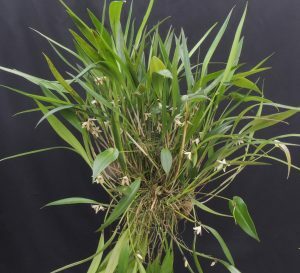 As you can see we are now on Day 686 and we hope that you enjoy your daily orchid as much as we do in the greenhouses. Today we have Octomeria grandiflora, a species we not be without. 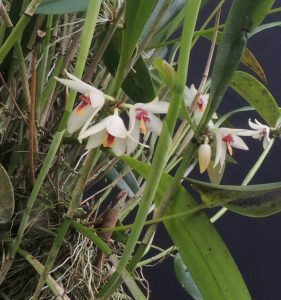 It is native to Brazil and we have seen it flowering in forests around Macae de Cima in Rio State growing amongst moss on the trunks of trees in humid primary forest (School trips have been to Brazil twice with the Rio Atlantic Forest Trust) . It appreciates shade and regular watering although we find it does well both mounted or in pots in our Cool Americas Section. The flowers are about 2cm across which seems rather small for ‘grandiflora’ but for an Octomeria species 2cm is huge! We find the species is almost always in flower but gives its main blooming in the autumn.